North Hills School District has been honored as one of the nation’s Best Communities for Music Education by the noted NAMM Foundation. North Hills School District is one of only seven districts in Allegheny County to be awarded the program’s highest designation this year. Only 388 school districts across the country were recognized with the honor. 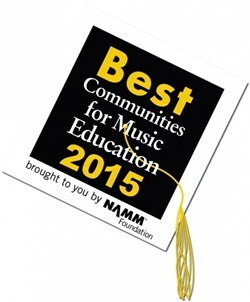 The Best Communities for Music Education designation is awarded to school districts that demonstrate exceptional efforts toward maintaining music education as part of the schools’ core curriculum. “It is an honor to be one of the 388 districts nationwide to be selected, and this recognition is a testament to the incredible educators and talented students who instruct and learn in North Hills School District’s valued music education program,” said Dr. Patrick J. Mannarino, North Hills School District’s superintendent. In addition to the districtwide honor, North Hills High School has been honored with a SupportMusic Merit Award for the third year in a row. The SupportMusic Merit Award is awarded to individual schools that demonstrate outstanding achievement in efforts to provide music access and education to all students. The SupportMusic Merit Award is awarded to individual schools that demonstrate outstanding achievement in efforts to provide music access and education to all students. The building is one of only three individual schools in Allegheny County to be recognized. At North Hills School District, nearly eight out of every 10 students has taken part in a music class or related activity during the 2014-15 school year. A total of 12 different classes are taught at North Hills High School, and students can enroll in 11 music class options at North Hills Middle School. All elementary students take part in a general music class and nearly 500 fourth, fifth and sixth-graders play instruments in the elementary band or orchestra.